Coffee addiction is becoming more prevalent around the globe. As the amount of coffee people consume is increasing, that consumption is spreading to a younger population. This has turned into a worldwide epidemic. People are drinking more caffeine and subsequently needing more to get the same feeling. This tolerance to caffeine levels in coffee is what eventually results in an addiction. Coffee is one of the highest sources of caffeine, a drug to which it is very easy to become addicted. Caffeine addiction can result in physiological and psychological symptoms whenever consumption drops below levels your body has been conditioned to expect. One way to determine if you are addicted to coffee is by looking at your caffeine assumption over the course of a month. Monitor how you feel before and after you drink your java so you can determine which symptoms you experience. To alleviate these symptoms, you either need to tough it out for a few days or return to your normal caffeine consumption. Many people feel an increase in alertness when they drink caffeinated beverages. This level of alertness may decrease as the body becomes tolerant to the level of caffeine consumed. Over time, you will need to consume more caffeine to achieve that same alert feeling. If you decide to reduce or eliminate caffeine, you may experience cravings. These cravings come from both your psychological and physical dependence on the drug. Not only is drinking coffee a pleasurable daily habit, it becomes a physiological dependence as well. If you manage to resist the cravings, they will subside after a few days. Overall, it's easier to break the coffee habit than many other addictions, and there are some good reasons for doing so. Like other drug addictions, caffeine can cause harmful health problems. If you have any pre-existing medical conditions, you should contact your doctor for advice about how your caffeine consumption will affect these health problems. Caffeine consumption and subsequent addiction can influence your life in a negative way, so you may need to discontinue drinking all caffeinated beverages. If you have a pre-existing heart condition, caffeine consumption can cause more damage from heart palpitations and increased heart rate. Blood pressure can increase with caffeine use, so if you already suffer from high blood pressure, be cautious about drinking caffeinated beverages like coffee and some energy drinks. 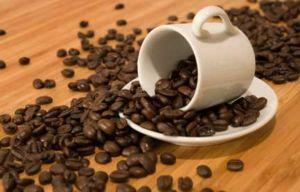 If you suffer from Irritable Bowel Syndrome, caffeine can increase your symptoms. Caffeine consumption can even cause gastric problems such as diarrhea and upset stomach. Frequent urination is another common consequence from large doses of caffeine consumption. Caffeine, especially when consumed in the evening, can prevent you from sleeping at night. This can cause fatigue, lack of concentration and irritability during the day if you are unable to get adequate rest. Reducing coffee consumption in the late afternoon and evening hours can help you sleep better at night and feel more naturally energetic and focused the following day. Coffee in large doses can cause nervousness, jitters and a feeling of being "on edge." These symptoms of caffeine overindulgence can be severe and prevent you from working or engaging in other activities. A decrease in coffee consumption can help alleviate these symptoms. Although a serious caffeine addiction can be harmful to your wellbeing, there are still some benefits to drinking coffee in moderation. You may want to weigh the pros against the cons when deciding whether you want to reduce your coffee consumption. Here are a few benefits you may want to consider. Caffeine from coffee gives you a power boost that can help you be more productive than usual, as long as you don't overindulge. The increase in heart rate and alertness helps people become motivated and accomplish more. This is the main reason why many people become addicted to caffeine so easily; they see the benefits to their productivity and want them to continue. Many people find that caffeine consumption helps them with their depression. The effects people with mild depression feel from caffeine, such as alertness, higher self-esteem, motivation and a general happy feeling, seem like a better alternative to depression symptoms. However, it is unlikely that caffeine is strong enough to help those who have severe or clinical depression due to the higher degree of their symptoms. Some health professionals feel that caffeine consumption can aid in weight loss. The caffeine from coffee increases the heart rate and provides you with more energy when working out, and that can help you ultimately burn more calories. Additionally, consuming caffeinated beverages can decrease your appetite. Caffeine is the most popular and widely used stimulant in the world. Many people inadvertently acquire a coffee addiction in an effort to become more productive in an increasingly faster paced world. However, it is important to consider your health when drinking large amounts of caffeine, and to consult with your health care professional about any concerns. As the old adage says, "All things in moderation". This includes coffee as well.